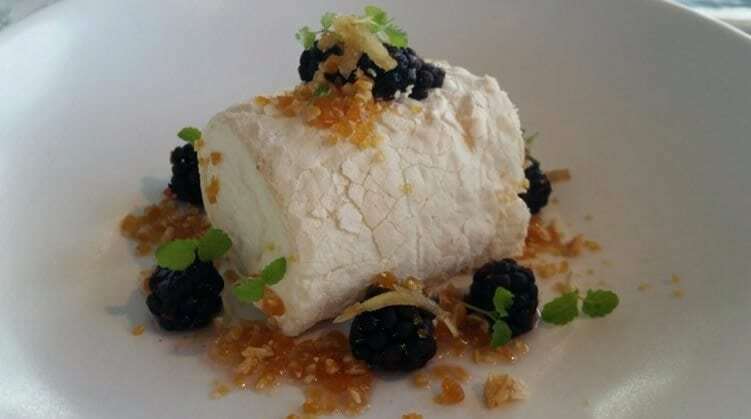 The humble meringue is an Aussie Christmas tradition, and Chef Josh has created this new twist on a classic. This is one of Josh’s favourite Christmas treats, and you will love this version with its delicious blackberries and crunchy almond praline. Another reason this dish is so special is the way it is served as a roulade, rather than the familiar ‘dollop’ shape. In a mixer whisk egg whites until frothy, slowly add sugar while continuing to whisk until all sugar has dissolved and you are left with a fluffy meringue mixture. Mix vinegar and cornflour to a paste and add to egg mix. Whisk for 30 seconds until well combined. Line a 2cm deep baking tray with grease proof paper. A 30cm x 30cm tray should be fine. Spread the mix evenly over the tray and place into a pre-heated 160°c oven and bake for 20 minutes. Allow to cool. While cooling, whip the thickened cream and vanilla bean until medium peaks form. On clean kitchen bench place a 40 x 30cm piece of cling wrap flat on bench. Dust the cling wrap with icing sugar. When meringue is cool, flip over onto cling wrap and spread whipped cream evenly over meringue. Use the cling wrap to start to roll the meringue up like rolling up a towel. When all rolled up, twist the ends and place in fridge to set. Place sugar, water, star anise, vanilla and ginger in a pot and bring to boil. Let simmer for 5 mins. In a pot, bring the castor sugar and 50ml water to boil and simmer. Place slivered almonds on a tray lined with baking paper. when caramel colour has developed pour caramel over almonds and allow to cool at room temperature. Break up caramel pieces and place in food processor and blend until coarse sand size. Store in freezer. To plate, cut roulade to desired size and place in middle of plate. Toss the blackberries through the ginger syrup and spoon over roulade. Sprinkle praline over and garnish with baby mint.